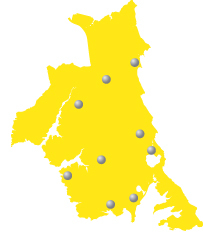 With offices covering the area Ray White North Shore are backed by the strength of over 165 New Zealand offices, plus more than 1,000 international offices across 10 countries. Our agents have the knowledge, skills and experience to help maximise the value of your property sale. It’s the reason we’ve sold more properties in Australia and New Zealand than any other real estate group. Ray White_Know How to sell your property for more. Just a short drive north over the Harbour Bridge, or a short ferry ride from downtown, you'll find Auckland's North Shore. North Shore City boasts a lifestyle and environment that set it apart as a destination for homemakers, pleasure-seekers and business people alike, and with a population of well over 200,000 many Aucklanders chose to call the region home. The natural advantages of a warm climate, beautiful beaches and spectacular scenery contribute to the popularity of the region. From a lively cafe and restaurant scene to great sporting and leisure facilities plus a thriving arts scene, you can discover it all in the North Shore. Click here to search Ray White North Shore's properties for sale.